Crete is the biggest island of Greece with the largest variety of landscapes. It is an island well known for its mountains with traditional villages and numerous beautiful gorges ending up to unspoiled isolated beaches with clear crystal waters. Miles of costal paths are connected with E4, the European path. Fascinating caves and wild rocks present their interesting wild beauty to the unsuspecting walker along with picturesque bays with long sandy beaches. Ancient places with temples and ruins of an old civilization unfold their secrets in every step of the visitor. Once you land on this land you can feel the powerful energy of the place, which has been the crossroad of old Mediterranean footprints. In South Chania, Chora Sfakion is a region of Crete, which remained untouchable and unaffected from any foreign conquer. The people of this land still maintain the free spirit of their ancestors and respect local traditions, while always being hospitable and open – hearted with visitors. The flights of the eagles in the area are breathtaking as they are an integral part that completes the unique setting. We choose to run this retreat in the peaceful fishing village “Lykos” as the place is the best combination for trekking and yoga. We’ll be happy to host you in one of our programs and guide you onto the beautiful Cretan land. For this retreat no special fitness level is required and there is no age barrier. So anyone with strong legs and the spirit of adventure to explore the Cretan land can join us. Also, for those who want to discover the culture of the island, taste a healthy traditional Cretan diet and enjoy the Greek light with the vastness blue of Libyan Sea this retreat is a unique one. Yoga philosophy is well combined with this landscape. The visitor can practise daily afternoon yoga sessions enjoying the sea view and having the experience of a deep relaxation of body and mind after the morning daily trekking. The soft and gentle guidance of experienced yoga trainers will lead you in a deep connection with your spirit. The program is designed to combine the activation of the body through the daily trekking program of 1- 3 hrs in a physical, healthy way. The natural environment, the healthy food and the daily yoga practice purify the body from toxins and liberate the mind from stress, and negativity. Finally, you’ll find yourself recharged more than ever. Live a unique experience and gain precious skills to transform and rebirth yourself. Feel blessed as you deserve to enjoy a special gift for yourself. We choose to run our y.t.t.c in the southern Chania region. In a small simple fishing village, where the energy is pure and serene, and the beautiful natural environment fits in yoga philosophy, just 3 steps away from the beach and the crystal clear waters of the Libyan sea. Your flight lands at the prefecture of Chania, the westernmost regional unit of Crete, which is one of the most beautiful destinations in Greece. The old town of Chania is considered to be one of the most beautiful spots on Crete, with its jewel - the charming old Venetian harbour of Chania, an ideal place for a morning coffee, sightseeing, romantic walks , shopping and nightlife. From Chania airport and after a 70 km route (1,5 hrs) towards the southern edge of Europe you can reach Chora Sfakion and Loutro. Ferries run between Hora Sfakion and Loutro every one hour during the summer season. Loutro is a small picturesque seaside resort village located on the south coast of the prefecture of Chania, in the region of Sfakia. Here there are no roads or car traffic, and apart from the ferry that comes and leaves, you will see small boats used either for pleasure or transportation, as the village is only accessible from the sea (or walking). Here you will find shops, restaurants and ferry connections. From Loutro on a 10 minute boat ride around the headland or a 20 minute walk you can reach Lykos beach in a sheltered, car-free bay. It’s where our Yoga Center is located. From our base – Center you can explore the beautiful coast line and beaches and the walking trails along the coast, in the famous Cretan gorges nearby and into the mountains behind. The local area is a heaven for wildlife including rare birds and spectacular Cretan flowers. There are many beautiful coastal, mountain and gorge walks that start right from our Center. The entrance to the Aradena Gorge is just 1km away on the beautiful Marmara beach and it is open to visitors all year round. Our accommodation is located in “Akrogiali” rooms with a variety of double, single, twin and triple rooms. All of the rooms overlook the sea, have balconies and attached bathrooms with solar heaters for hot showers. In the front garden of Akrogiali rooms there is a traditional restaurant, where a friendly Cretan family is preparing vegetarian meals for us daily, using traditional Cretan and Mediterranean recipes. 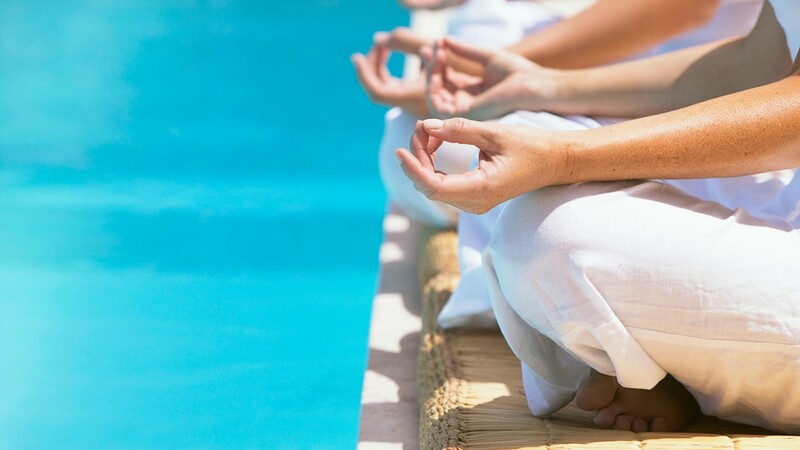 Our yoga shala is located in the village of Livaniana with a panoramic view of the sea and Lykos beach. Including accommodation, 3 meals per day , one daily morning hiking trial, daily afrernoon class and evening chanting and one day boat trip. For your booking please deposit into the bank account 400€, which is non refundable, 30 days before starting the retreat. In case a student leave during a program for any personal reason, Breath of life is not obliged to return money back.